Long before he came to NC State University, senior Patrick Conner heard – and heeded – the call of a wolfpack. As a 7-year-old, Conner spent a night at a wildlife preserve. Sometime between handling snakes and hitting the hay, he and his fellow Cub Scouts sat around a campfire while a preserve employee howled into the night. That realization has carried Conner a long way. In 2014, it brought him to NC State, 800 miles from his home in Imperial, Mo. And in 2016, it took him nearly 10 times farther, to a summer study abroad program in Namibia. There, Conner saw firsthand how ecology and conservation work in the African country. He learned and tried different methods for tracking, sampling and monitoring wildlife. At the N/a’an ku sê Wildlife Sanctuary and a Namibian national forest, he and his fellow students interacted with cheetahs and saw elephants, hyenas, giraffes and more. One night, they stayed up until nearly dawn to see a group of lionesses. Conner fed African wild dogs, a type of canine he’d first encountered at the Missouri wildlife preserve where he had the wolf encounter that set him on his current path. One element of Namibian ecology that stuck with Conner was the role that foreign volunteers play in it. European vacationers made up much of the volunteer staff at N/a’an ku sê. Conner hasn’t strayed far from his original vision for his future, although his interest has broadened beyond wolves. 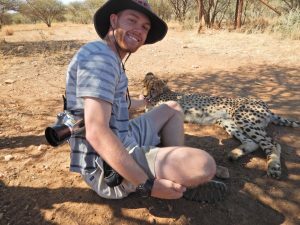 As a student in the College of Natural Resources, his classroom studies, internships and study abroad experiences have all prepared him to work with endangered canines and large mammals. As much as he may have seemed destined for his current world, enrollment at NC State was never an inevitability for Conner. There were barriers to his eventual arrival. The first was geography. NC State draws students from across the country and around the world, but only a few from Missouri, where Conner grew up just south of St. Louis. In 2014, his freshman year, Conner was one of 33 Show-Me-Staters in an NC State student body of nearly 34,000. One in a thousand, literally. But Conner knew he wanted to go to college out of state, and he knew he wanted a school with strong programs in the natural sciences. He visited Colorado State University and the University of Wisconsin but fell in love with NC State. North Carolina’s natural beauty appealed to him. So did the commitment of College of Natural Resources faculty members to building relationships with their students. The other obstacle for Conner was financial. He’s a first-generation college student, and out-of-state tuition sometimes seemed beyond his family’s budget. Private support, in the form of the Bull Neck Swamp Fisheries, Wildlife and Conservation Biology Scholarship and the James L. Goodwin Scholarship, both through his college, made the difference for Conner. Without that support, he said he probably would have stayed in Missouri. Scholarships also made the Namibia trip possible. Funding from the Study Abroad office and the Chancellor’s Study Abroad Scholarship program covered 80 percent of the cost of Conner’s trip. He has paid that support forward by sharing his extraordinary experiences with students from groups that are generally underrepresented in overseas study programs: men, STEM majors and ethnic minorities. After graduating next spring, Conner hopes to go to graduate school. Eventually, he sees himself continuing the work he has begun in internships and in the classroom at NC State.